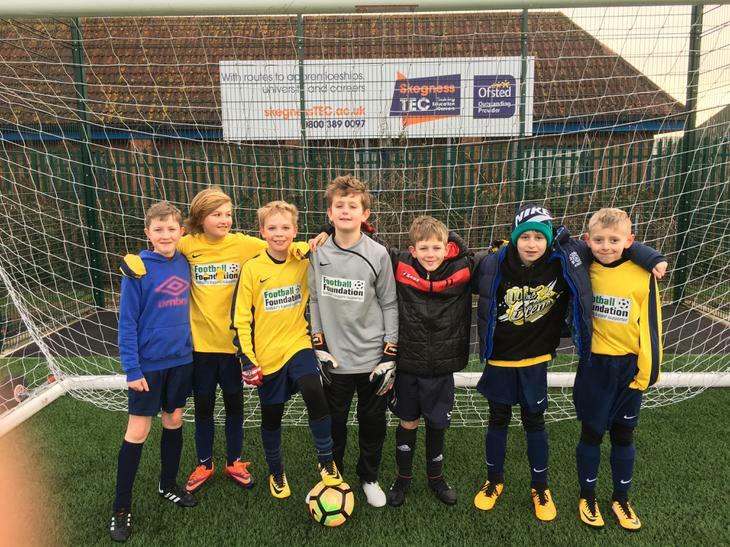 In freezing conditions, on the superb 3G pitches in Skegness, the football team performed with heart and resilience against the best small school teams in Lincolnshire on Saturday. Due to the reduced squad numbers, the whole team played every minute and performed admirably. Nerves may have played a part in the opening 3-0 defeat to Colsterworth (the eventual champions) despite outstanding defensive work from McCartney and - in goal - Wray, who saved superbly on two occasions. Supporters were nervy themselves after Grasby took a quick 2-0 lead in the second match. However, BcL were inspired by a superb midfield performance from Heather, who drove the side on with crunching tackles, endless energy and creative passing. Slater began to show his speed and skill, culminating in a superb 20 yard strike into the top left-hand corner. With Keating and Bogg supporting well in midfield, BcL were taking control of the game. Soon after, with confidence flowing, Slater shot from distance again, bringing out a great save from the 'keeper. Fortunately, Hayes - Sadio Mane-like - was on hand to prod home from close range. It was a shame that against the run of play Grasby squeaked home a winner as BcL certainly deserved at least a point from a highly entertaining match. In the third match, against the highly fancied Our Lady of Lincoln (runner's up in the final), BcL took the lead in the opening minute. Having looked dangerous from corner kicks throughout, Slater's kick found Heather who hit a great strike off the bar to make it 1-0. As the game progressed the quality of the oppositions number 7 shone through and he almost single handedly turned the match. Despite brave defensive work from Bogg, McCartney, Keating and the superb Wray in goal (who made a string of excellent one on one saves during the tournament) Our Lady scored twice to earn a semi-final place. The team deserved at least a point in the second and third games and were unlucky to leave Skegness empty-handed. A play off for 7th and 8th ended in a disappointing defeat, but tired legs played a part. The team played with pride and superb sportsmanship throughout and the heart they showed in the second game encapsulated their effort. A huge thank you to all of our supporters and a special mention to Mr Slater and Oscar for coaching on the sidelines and to Mrs Wright and Ms Fisher for their support.